Yellow Land Earth Queen is one of the Chinese names for the Earth Goddess. She was said to have created humans from a ball of clay. In other accounts, the serpent goddess Nü Gua Shih formed people from the yellow earth, ordained laws for them, and raised up the sky on tortoise-leg pillars. Earth was venerated in the form of the cong (tsung), a rectangular jade pillar with a cylindrical hollow running though its center. In Taoist cosmology, yellow is the color of Earth and the Center. 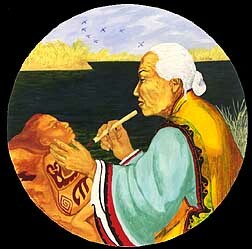 Mystics sometimes refer to the divine female principle as the Golden Mother or Yellow Woman.